(without stand or speakers) 31.5" x 22.0" x 6.8"
Continuing the Westinghouse tradition of innovation mixed with convenience; meet the new Westinghouse SK-32H570D. 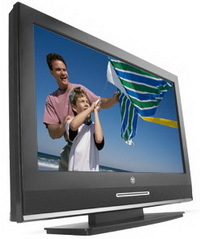 This versatile 32" widescreen DVD combo features an integrated ATSC/NTSC/ClearQAM tuner and front slot-load DVD/CD player. Expertly designed to fit cleanly into any space, this deceptively thin combo unit offers such top-of-the-line features as Pixel Direct™ technology for a short signal path, SpineDesign™ side connectors for easy accessibility and Autosource™ automatic source detection. Included are two (2) HDMI® connectors to ensure maximum connectivity now and in the future.